These belt driven fans are heavy-duty, all welded units available in 3 different configurations for material (Model L/M) or air handling (Model A) applications. 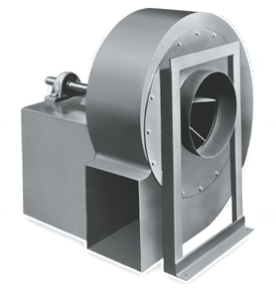 The Peerless Blowers Industrial Blowers have been designed to meet the requirements of all modern industrial air moving and pneumatic conveying applications. These units have a proven record of long-lasting, efficient operation in material conveying, dust & fume removal, mechanical draft & handling of hot air & industrial process gases. Ruggedly constructed of heavy gauge all-welded steel, these units are built various AMCA standard drive arrangements and to individual special requirements of original equipment manufacturers. They are available in three variations of wheel design. Inlet sizes run from 7 thru 33″ (12-1/8 thru 57-1/2″ wheel diameter) and are available in standard and heavy duty construction. Our many accessories and arrangements allow for various individualized applications.